I run sites on both WP.com and WP.org. Can I use this plugin with my WP.com site? No. You can’t use the plugin on wordpress.com. Seems to work on the MailChimp side of things, yet when a user fills out the form it doesn’t fully submit on the front end. I do receive the email, and the user is entered into the MailChimp list, but not he form itself the /contact-form-7/images/ajax-loader.gif image loads but doesn’t go away and there is no success message. Any insights here? Have you looked to see if the plugin is writing any logs? I having the same issue, when I uninstall your plugin the confirmation is there..
Also in my case, the name and email aren’t added in Mailchimp..
Hi there – nice add-on! My question is, I already had a C7 form set up with the submit going to a specific email address. Do I need to set up a new C7 form for your add-on to take effect? I guess my basic question is once I add the API key, etc. what changes do I need to make on my C7 form? 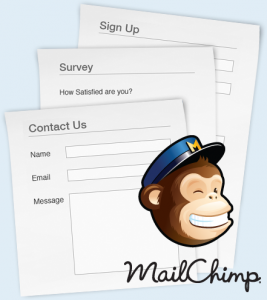 How do I put in my mailchimp API? Does it need to be edited directly into the php code? Could you add a settings where its easy to paste in? Read this page and everything will be clear. Great plug in, works well and easy to use! Thank you to the author! I would like know if it is possible to disable the single op in for some forms on a website, but not for other forms on that website. At the moment the double-optin applies globally to all forms. If I get enough interest from people I may consider adding your suggestion as a feature. Is it possible to use different “Contact Form 7” forms to add to different MailChimp lists? I wandered, it could be very useful to do the same for wpdownload-manager. Nice work by the way. I am using this plugin in conjunction with another plugin that takes the same information from my contact form and creates a contact in the software. The problem I’m having is that the field name requirements are different for this plugin vs the other plugin. This one requires it to be your-first-name and the other needs it to be FirstName. Is there a way around this so that I can use both plugins? I forgot to mention that the other fields that are affected are LastName and Email and these are the only three fields that I would need to work together. Thank you! Hi there.. just testing the addon and works fine… just a question.. cant get it wotk on two forms.. ? is this a bug ? It should work on as many forms as you need. Check your field names and also check to see if there are any logs produced – if so there will be a file called “cf7_autoresp.log” in the plugin’s directory. Thanks for writing this. When you set it up is there a way to send people from different forms to different lists? I am a big novice when it comes to html and php…I loaded the plug-in along with my Contact Form 7 plug in, told it my Mailchimp API key…but I don’t know how to tell my forms to send the email address to MailChimp now that I activated your plug-in. As you long as you’ve specified to correct API key and list name in the plugin’s settings it should automatically add people to your list whenever someone submits one of your CF7 forms. Note that your CF7 must have at least one input for email and this field must have its name set to “your-email”. I am really looking forward to the Aweber integration and I believe so are a lot of people like me. I really wish you have the time to do the coding asap. I’ve just officially released the premium version. See the plugin’s page for more info. Thank you. It would also be very helpful to pass through a MailChimp source or group to identify where a contact came from. For example, I have several free downloads available on my site. I’d like to know which download a person accessed that lead them to my list so I can follow up accordingly. Yes I hear what you’re saying and I think it’s a good suggestion. However due to time constraints (and the fact that this is a free plugin which I support in my “spare” time) it’s not always possible to add features constantly. However I do take note of people’s comments and will seriously consider adding this in future. Thanks for your comment @Inti.